Don Hazlitt's mixed media painting, Sunset, is currently on display as part of 50x50: The Herbert and Dorothy Vogel Collection. A professor of art in the MFA program at Molloy College in New York, Hazlitt has a long history both as an artist and an educator. Hazlitt’s art challenges the boundaries of what we consider painting, collage, and sculpture; Sunset encompasses elements of each of these three traditionally separate art forms. 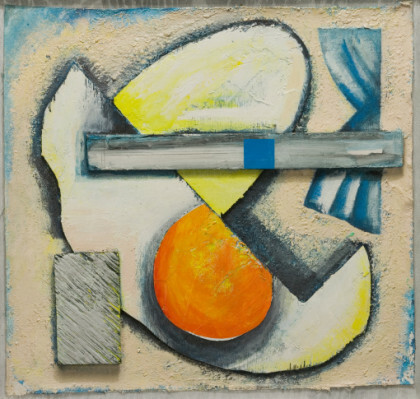 Don Hazlitt, Sunset, 1989, mixed media on board with painted frame. Image source. Sunset, made specifically for Herb and Dorothy Vogel, seems to be a finished piece, seamlessly fusing not only different media together but also the painting and its frame. Untitled is much less finished, leaving visible artist’s notes in pencil and smeared fingerprints on the front and back of the page.